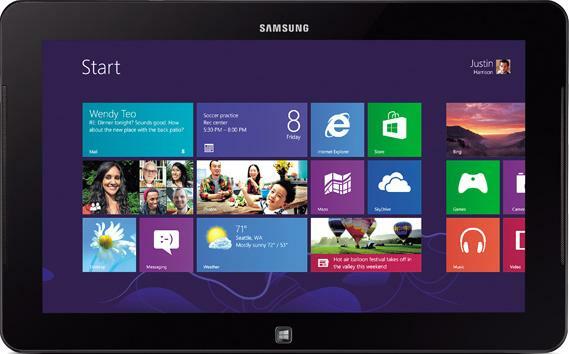 Samsung recently introduced the ATIV Smart Tablet PC model with "Full HD Touch". How does this compare with the A04US model that I reviewed last December? The K01US model has a faster and newer operating system (i5-3337U at 1.8GHz) and lower-grade version of Windows 8 (standard windows 8, not professional). It includes the detachable keyboard, an important $100 accessory that is missing from the A04US model. The K01US model does not include the TPM security feature. Model K01US, as of June 2013, is the most capable consumer-grade Tablet PC. The improved CPU and WiFi over the A01US model and comparable street price make K01US the better buy. If you need TPM security, as is typical for a business environment, A04US and A03US remain the only options available. The A04US model, the most expensive (because it lacks the detachable keyboard accessory) option, is targeted at businesses needing TPM security and Windows 8 Professional. The A04US model is now available with AT&T cellular networking. Read about this new model here.